The Edgewater suite in Peachland offers a beautifully landscaped private waterfront oasis with a large swimming dock and tie up buoy for your boat. This lakefront suite is nicely appointed and ideal for a small family or couples traveling together. All rooms have a fabulous view of the lake. Enjoy a stroll down the path lined with lavender and roses, to the lake. Peachland boasts 11 kms of continuous public beach with a marina, boat launches and lifeguard supervised Swim Bay. Meander along the lakeside, explore shops or stop at the Bliss Bakery for breakfast or lunch. Enjoy the small town atmosphere of Peachland, and yet you are only a 10km (5 min)drive from West Kelowna with all the conveniences of a large community, shopping, restaurants, movie theater and multiple attractions. Peachland is the best of both worlds. Locals say our postal code V0H is for Valley of Heaven. 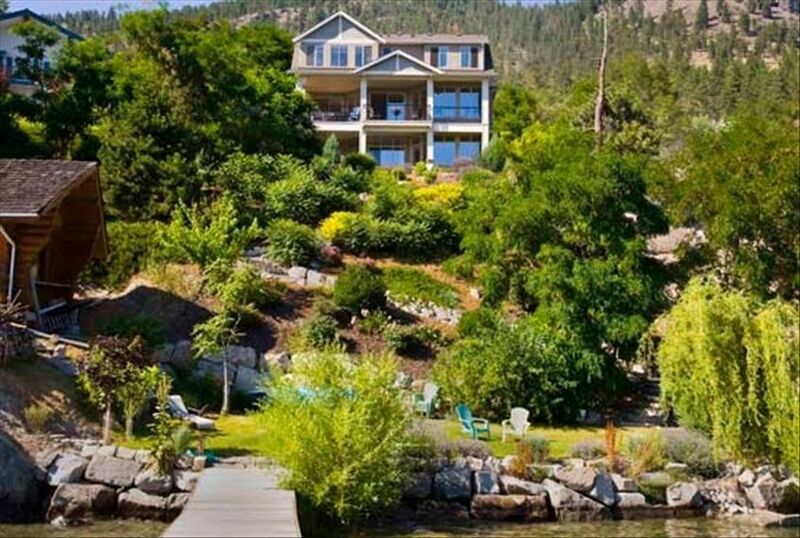 We are semi retired couple who have built our dream home on Okanagan Lake. We love swimming, biking and hiking the area in the summer. In the winter we enjoy the wonderful cross country skiing that is close to the house. Over twenty years ago we pedaled into this valley on a family bike trip. We fell in love with the area and the people. We returned year after year, always finding one more special place, one more activity we enjoyed. We usually stayed at small cottages or B&B's. We enjoyed the experience and this is why we added the suite to our home. There are every few homes on the lake in Peachland, our property is unique in that it offers a small private paradise directly on the lake. The area has every thing from award winning golf courses & elegant wineries, to small family run wineries and biking the Kettle Valley Railway Trail. Bathroom with large vanity, toilet, tub with shower. Lakeview from every room in the two bedroom suite. Lovely view of the garden & lake from the patio. Lovely lawn area next to patio and down by the lake. We have a large garden with lavender, roses and more. We spent 3 nights in this comfy space with a fabulous view of the lake. As it was early in the season we did not take advantage of the lake front sitting area or bbq but enjoyed wine tasting and the Shift yoga studio nearby. The owners were helpful and attentive even while they were away and the property was as described and presented in the photographs. We certainly intend to return! The place was awesome. View was spectacular. Didn't get a chance to meet with Mary. But she called to ask if everything was okay and whether we needed anything. We really enjoyed our stay. Great place, quiet and beautiful views on the lake. Beautiful , right on the lake, private. A lovely retreat even in the absence of fine weather. Mary and Kelly have a built a beautiful escape. The view is stunningly beautiful and the accommodations are very comfortable. Peachland is my favorite place in Canada and we will be returning to this home again. Excellent property right on the lake. Very clean and well equipped . Had an excellent stay at this property in Peachland! Right on the lake with very helpful hostess. We enjoyed the dock and swimming. Thank you Mary & Kelly for a wonderful stay! Your hospitality is always appreciated and we all love coming to stay in Peachland!